Hey Barbs, I found an amazing tip in this months issue of The Gardener which will help protect our Lemon Trees from aphids and scale. 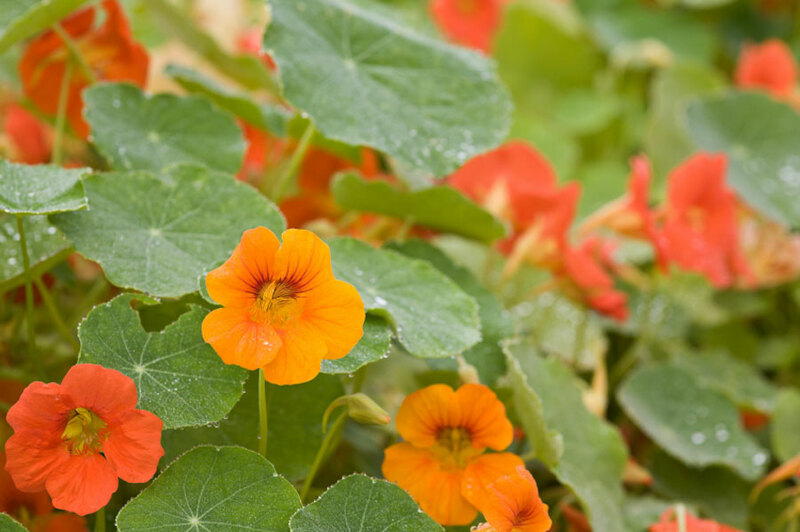 Here’s what they say … Sow Nasturtium or rue seeds at the base of fruit trees. Their presence appears to act as a deterrent to sap-sucking insects like aphids and scale. Concoctions brewed from the leaves of these plants are also used as organic sprays to deter these pests! So I am going to buy Nasturtium seeds … they used to flourish in my garden, like a weed,along with the Ivy. We ripped them all out and I’m not mad about the idea of having a Nasturtium invasion again, but if I control their growth and just have them growing around the base of the lemon tree I think it could actually look quite attractive. What do you think? Worth a try if it keeps the nasties away! And I know that some people put Nasturtiums in salads and use them in food preparation … so that fits in with you “edible” theme! I’ll get you some seeds when I go seed shopping this week. Well, this is great news and thank you for the Nasturtium seeds! I have always liked them as a ground cover – and they are edible! Best for my organic way of gardening! I do hope the chickens do not find them edible! hmmm! I’ve been reading up more about this – and it seems it works really well on ALL fruit trees notably apple, peach and citrus. Also repel codling moth! Chives can help your tree from forming apple scab. Nasturtium repels codling moth. Foxglove is said to help protect your tree from disease, and to help your apples last longer once they’re picked. Other good companion plants for your apple tree are onion, garlic, sweet woodruff and wallflower. Basil planted at the base of your peach tree will help deter fruit flies. The strong scent of garlic and onions planted near your tree will keep other pests away. Tansy is great for deterring pests, but use with caution if you have livestock nearby, as it is toxic to animals if eaten. Other good companions for your peach tree are asparagus, grape, onion, southernwood and strawberry. Many of the plants that are beneficial to apple and peach trees are also helpful for pear and cherry trees as well: garlic, onion, tansy and nasturtium will keep those pests at bay. Pear tree also do well planted with currant.